Needless to say I was surprised at these results. As you know, we run tests in-house on a regular basis, to make sure that SEO SpyGlass stands to its status of the most data-rich backlink checker. So it was quite surprising, why on the three sites tested by Matthew, SEO SpyGlass was observed as the poorest performer. Some commenters in fact asked Matthew to reveal the websites he analyzed, but unfortunately he cannot provide the info. Therefore, we didn't get a chance to test the same sites in-house, to see with our own eyes, what SEO SpyGlass and other tools actually show and what might be wrong about SEO SpyGlass (if anything at all was wrong). Therefore, I decided to do my own little study on other URLs, to see how results compare in different tools. What made the results so different? After just a few minutes, I realized the reason for such big difference in the number of backlinks is most likely the methodology used by the blogger. Certain nuances of how the analyzed backlink checkers store, organize and present data were not taken into account. And these nuances are of extreme importance. So, what I discovered in the course of my experiment will be revealed below. Quite obviously, if Matthew used the total number of links reported by Open Site Explorer, it's no surprise it was bigger than the number of backlinks reported by other SEO tools, as OSE actually mixes your internal links (that is, links from different pages of your own site) with links from external sources. If there are two links to a site from the same page, Raven and Ahrefs display them both. Which doesn't make much sense because the common assumption among SEOs is that only the first link from a page matters for search engines (if there're two links with the same target URL). So, in the majority of SEO cases, you would need to know backlink pages. And this is what we really mean when we say "The software finds bakclinks": it finds pages with backlinks. This is like at elections - you can cast only one vote. Google doesn't care whether there are 1 or 10 links pointing to a site from one and the same page (well, 10 links may even look spammy). Ahrefs does give two separate numbers, though: one is for the number total of backlinks and the other one is for number total of referring pages. In my little study, the latter number by Ahrefs was smaller by almost 1000. As far as Majestic SEO is concerned, it also appears to display backlinks, not linking pages, but I was unable to confirm that with the trial version. In any case, in my particular case, Majestic reported slightly fewer backlinks to the site I analyzed than SEO SpyGlass. None of the other tools explicitly shows whether the links they show are existent at the moment. A large percentage of links are history. Ahrefs and Majestic say that they are cleaning up their indices at certain times. However, numerous "dead" links still show up on the report. 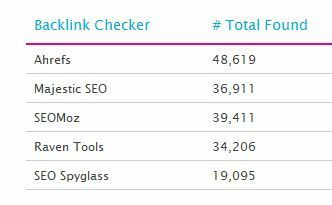 Note: this data only goes to show that different backlink checkers organize and present stats in different ways – I do not intend to proclaim any backlink checker the best one based on such scarce data. Besides, it should be noted that, unlike many other backlink checkers, SEO SpyGlass places no cap on the number of backlinks you can analyze with it. At this point, I wouldn't be shy - I do believe that SEO SpyGlass clearly wins. Considering the amount of links you get at any moment, for an unlimited number of sites, as many times a day as you need - SEO SpyGlass is absolutely the best value for your dollar. UPD: We just got a reply from Matthew where he confirms that this was only an initial, not very clean experiment where he didn't look at the actual origin of links, or whether the links are live. Matthew is going to run a few more tests getting into the nitty-gritty, so I do believe SEO SpyGlass will show itself as a leader once the new tests are done. Yahoo! Site Explorer shut down: What will happen to backlink checkers after Nov 21? Group your links in SEO SpyGlass – manage loads of backlink data the most convenient way! Unrivaled depth of backlink analysis for the lowest price!